with Unusual Event overlays and more. Learn how the buyback is impacting shares outstanding; see how the ratio compares with peer companies. Is the company's buyback effectively impacting EPS? Qualitative research highlighting the most actionable positive and negative buyback activity and plan changes. Super-screen with these alerts to ensure that you never miss important activity at your companies. Alerts can be sent on a daily or weekly basis. 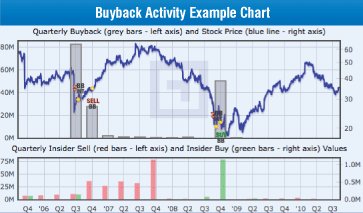 A quarterly summary of the activity at your companies after all buyback updates are processed. View aggregate buyback data for all major sectors and indices. Screen for the most positive and negative levels of company activity. To stay on top of buyback trends, receive our quarterly summary report, which highlights market-wide activity. The database contains all plans and quarterly updates since 2004 for all US companies and a majority of foreign companies that file 6Ks. available for quant models and exporting to your internal systems.